Gallery 1855 will host a one-of-a-kind exhibition by local artist Stasia Tikkanen. “Landscapes with a Gist” will run from April 3 to 30. An open house is planned from 1 to 4 p. Sunday, April 8. The exhibit features conceptual landscapes that include a night-and-day series, an in-studio series exploring perception related to the time of day. 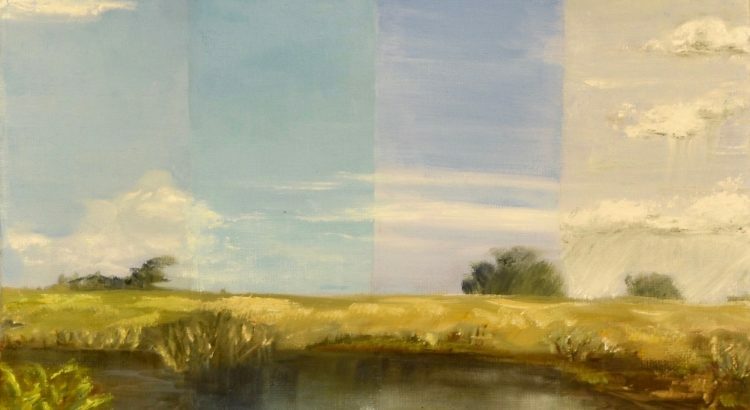 The artist paints two scenes from the same environment, one in nightlight and the other in daylight to see how light alters the perception of a scene. In this series, she has explored subjectively chosen scenes in Davis. Originally from Albuquerque, N.M., Tikkanen moved to Davis 16 years ago. With a bachelor’s degree in fine art studio from the University of New Mexico, she has worked as a professional studio artist, decorative painter and in galleries for a total of 20 years. In 2013, she became a full-time studio and plein air artist. The idea of conceptualizing landscapes got the attention of several patrons interested in specific themes. In 2014-2015, Tikkanen was privately commissioned to paint a landscape series featuring the high deserts and mountains of New Mexico and Arizona. This series reflects the culture of the area through color and subject while portraying the unique lighting of the high desert mountains and land features. In 2016, Juanita Bucot published one of these paintings, “The Sandias,” as a book cover of her fiction novel “Spirit Gone Wild,” a journey through the southwest in the 1960s. Also in 2016 the artist focus extended further into the outdoors and scenes of Northern California.